We constantly get asked about materials that can be used to rejuvenate an old concrete patio or spruce up concrete around a pool. There are a lot of options for this such as staining the concrete, a decorative coating or a patterned cement overlay. While these options are viable, effective, and cost effective, they definitely require patience in surface preparation and require a fair amount of labour. Now there is a new and exciting product that we can’t wait to share with you. Introducing Azek Resurfacing Pavers available at Advanced Building Materials. Azek resurfacing pavers are a 4″ x 8″ paver that is made up of 95% recycled tires and plastics. The paver is available in 5 beautiful colors, is scratch and stain resistant, and is very low maintenance. Azek Pavers use a patented grid system that dramatically reduces installation time and takes the frustration and difficulty out of manually setting and aligning heavy concrete pavers. This patented grid is laid right over top of your existing concrete and the pavers are set into the grid in the pattern of your choice. Colors of resurfacing pavers can be mixed to bring added flair to your project. Azek pavers are very easy to install requiring very few tools. Check out the installation video below to see how Azek Resurfacing Pavers can help you turn that drab concrete patio into a spectacular show piece. Azek pavers available at Advanced Building Materials in Sarnia. Stop by today and talk to one of our friendly staff about your next project. Sealing expansion and control joints in your concrete driveway. We get asked this question all the time. What material should be used to fill an existing expansion joint or control joint in a concrete driveway? Polyurethane caulking is the best material for this project and is available in self levelling or non sag varieties. Self levelling materials can only be used in expansion joints where there is no slope. Non sag materials require tooling in order to smooth them out. Polyurethane can be tooled with a variety of tools but a latex glove and your finger will work just fine. Also, have some dish soap and water handy. Dip your finger in the dish soap and water and run your finger along the joint to smooth it out. The water and soap will not hurt the caulking. This only applies to non sag materials. Self Levelling polyurethane finds its own level and makes this project a heck of a lot easier. Here are some other tips to help you get this job done right! Determine the width and depth of the expansion joint. A good rule of thumb is the depth of the caulking should be half of the width. This will give a good dimension for the caulking to remain at its optimum flexibility. If the expansion joint is really deep, consider using backer rod in the joint to ensure you get the bead thickness desired. For instance if the expansion joint is 1/2″ wide, set the backer rod to a 1/4″ depth. The backer rod should be slightly bigger than the expansion joint to allow the backer rod to compress into the joint and expand against the sides of the joint. On a 1/2″ expansion joint, choose a 5/8″ diameter backer rod. The backer rod fulfills two purposes. It sets the depth of the caulking, and the caulking will not stick to the backer rod which means the caulking will only have two sided adhesion and only move in one direction. Avoiding three sided adhesions will optimize the physical characteristics of the sealant. What if the expansion joint is nearly level with the concrete surface? The expansion joint needs to be cut down a minimum of a 1/4″ below the concrete surface. Also, the expansion joint must be isolated as well. Filament tape can be placed over the expansion joint material prior to caulking. This will ensure that the caulking does not stick to the expansion joint preventing three sided adhesion. The sides of the expansion joint must be clean in order for the sealant to stick. A wire wheel or wire brush can be used to accomplish this. Clean the joint after with high pressure water however, the joint must be dry when applying the sealant. Applying a polyurethane over top of a damp or wet joint will result in the sealant bubbling. If there is concern of polyurethane sticking, there are concrete primers available that will help with the adhesion of the product. Once the sealant is applied 1/16″ below the concrete surface, you should protect the area until the polyurethane becomes tack free. This will usually take 1-2 hours at 23 degrees celcius. A good way to do this is to cover the caulking with a #32 mesh sand. Once the caulking has cured, sweep up or blow away the sand. This will give the caulking a nice grainy natural look that will blend well with the existing concrete. Control joints or saw cuts should be addressed the same as above. The control joint can be filled with backer rod or even sand. Filling the saw cut is mandatory as control joints are 1/4 the thickness of the concrete. On a 4″ slab, that is a 1″ deep saw cut and nobody want to use that much caulking. Fill the saw cut 1/4″ to 3/8″ below the concrete surface and proceed as above. Please see the attached video which was found on youtube. This company goes through all the right steps for completing this project. Hope this helps. If you have any questions regarding any concrete caulking applications, give us a call. Advanced Building Materials. Your source for “Advanced” products and solutions. Concrete sealers for stamped concrete are generally acrylic sealers that leave a glossy shine, giving the concrete a darker appearance or “wet look”. These sealers leave a film on the surface of the concrete that protects the concrete from water, salt, ice melting agents, spills of mild chemicals and vehicular traffic. Acrylic sealers that are used to maintain the shine of stamped concrete should be applied to the concrete surface once every two years. It is important to note that although stamped concrete loses its surface gloss, the acrylic sealer is likely still in the pores of the concrete surface, unseen but still capable of sealing and protecting. Although the intention of a yearly re-seal is to maintain a well-sealed surface, applying another coat of sealer year after year can lead to heavy build up of product, which in turn can cause bubbling, peeling, and moisture entrapment under the sealer which can lead to blushing or discoloration. Acrylic sealers should be applied to concrete when the air and concrete temperature are at least 7 degrees celcius and rising but not higher than 23 degrees celcius. This is critical for proper film formation or reaction with the concrete. Application when the temperature is outside this range can cause the sealer to bubble, turn white and/or dry chalky instead of as a clear, strong film. It is best to seal the stamped concrete in the morning before the concrete has the ability to absorb the heat of the afternoon sun. If power washing the concrete prior to application of the sealer, it is best to wait two days as sealing wet concrete or concrete with a high moisture content can cause a sealer to blush or turn white. Most products can be applied with a sprayer or paint roller. When using a roller, choose a 10mm nap and apply two thin coats of sealer to the concrete surface. Although this will take more time, this will ensure the sealer is not being applied to thick. The first coat will soak in to the pores of the concrete and the second coat can be applied two to twenty four hours later providing a glossy protective finish for your stamped concrete project. When applying the acrylic concrete sealer, ensure that the coverage guidelines of the product are being strictly adhered to. Measure your project and aim for around 300 ft2 per US gallon or 90m2 per 3.79 liters. 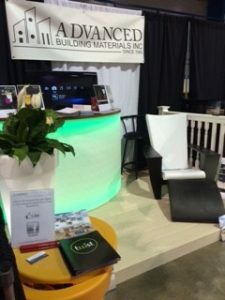 A big thank you to everyone that stopped by to see us at the Sarnia Home Show in April. We had a lot of interest in the Twist planters, furniture, and outdoor patio lighting that we had on display. Twist is a Canadian manufacturing company that offers outdoor furniture, planters, patio lighting, and Christmas decorations, all of which cast off a beautiful light that can be used to accent any interior design and exterior landscaping project. All of their products plug into a regular 110v outlet, are made of durable pvc and are uv stable. For lighting of a patio look into the planters, coolers, or lighting which consists of round moon, icicle, and teardrop shapes. These products will bring character and charm to your outdoor living space and are definitely a conversation piece. Want to make that Christmas tree look extra special this year. Twist now has a planter for your Christmas tree that holds the tree securely in place and casts off a beautiful glow making your tree look extra special. Available in red and white for the holiday season. Come by our showroom at 591 Gladwish Drive to check out this innovative product line. Store hours are Monday to Friday, 7:30 am to 5:00 pm or go on line to www.twistproductions.com and check out the many unique items Twist has to offer.